Unveiled at CES earlier this year, Sharp's Quattron Pro range of TVs boasts 10-million more sub-pixels than your average 1080p flatscreen and has just become available in the UK. Available in the UK from today, Sharp's new Quattron Pro screens are the "future-proof" alternative to wallet-stretching 4K televisions. Sharp's new TV boasts a retina-tingling 16-million sub-pixels, and arrive as the only 1080p screen capable of playing native 4K content - albeit not in 4K resolution. The blistering quality is achieved thanks to Sharp's four-colour tech, meaning they've added a yellow sub-pixel to the standard RGB pixel you find in normal TVs. Coming in varying screen sizes - ranging from 60” all the way up to the party-sized 80” edition - the Quattron Pro will hit your bank balance to the tune of between £1400 and £3600, depending on your chosen model. Sharp's target market are viewers eager to see beyond standard HD, but aren't quite ready to fork out for a 4K screen just yet. 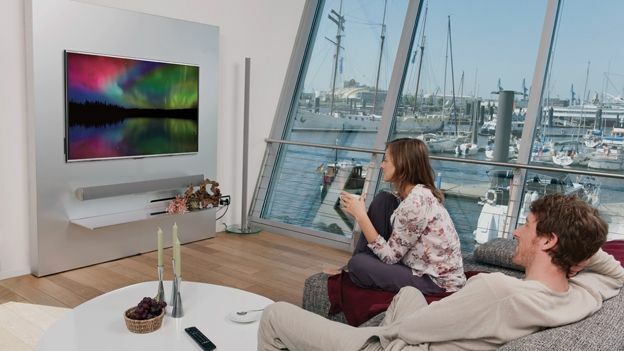 “Our UQ10 TVs with Quattron Pro technology offer consumers a solution; a TV with a Full HD panel, so it's more affordable, but with a smart way of handling sub-pixels so it can effectively display Ultra-HD content,” says Alberico Lissoni, Sharp's president of consumer electronics.